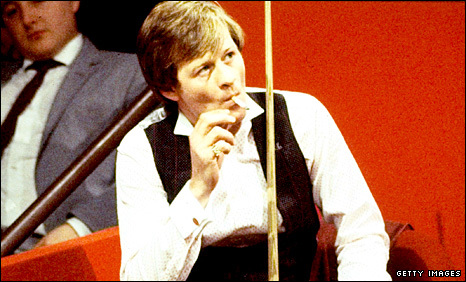 Higgins was one of snooker's biggest stars of the 1970s and 80s. Snooker fans will get the chance to relive the sport's golden age after the announcement of a new £50,000 World Seniors Championship in November. Six former world champions - including Alex Higgins, Steve Davis and Ken Doherty - will be joined in Bradford by Jimmy White and one further qualifier. Dennis Taylor, John Parrott and Joe Johnson are the other former world champions to be involved. Tony Knowles and Tony Drago are among the players in the qualifying event. Mike Hallett, Darren Morgan, Nigel Bond, Joe Swail, David Taylor and Dave Harold will also battle it out for the right to play-off against Peter Ebdon for the final qualifying place. The presence of legends of the game like Higgins, White and Davis is seen as part of the plans of Barry Hearn, the new chairman of World Snooker, to reinvigorate interest in the sport. Is this a good move for snooker? Snooker regularly attracted millions of television viewers in its 1980s heyday, with 18.5m famously tuning in well after midnight to see the conclusion of Davis and Taylor's 1985 Crucible final. The Seniors event - which will be held at Cedar Court Hotel in Bradford from 5 to 7 November - will be played over three frames in the quarter-finals, five frames in the semi-finals and seven frames in the final, with the qualifying tournament following suit. Johnson, the 1986 Crucible champion, was involved in setting up the event, and said he received a warm response from the Hearn regime. "I have been working very hard to pull this concept together and I am glad that with World Snooker's help we are making it a reality," said Johnson. "I cannot wait to get out on the floor and battle it out with my old friends and adversaries. Snooker fans have been crying out for this type of event and I am sure that we will do our best to put on an entertaining Championship."